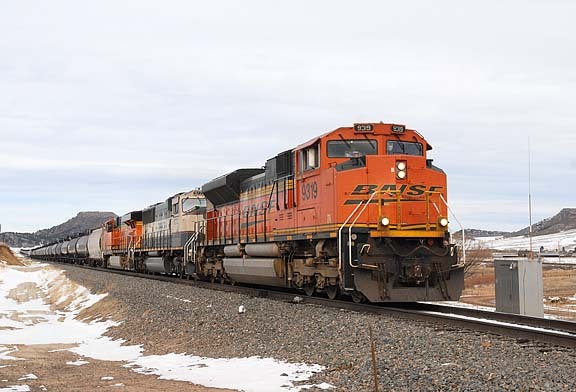 (This article originally ran in the March, 2013 Camera Bag column in Railfan & Railroad Magazine. A wide angle lens is often needed in the tight confines of a building interior. 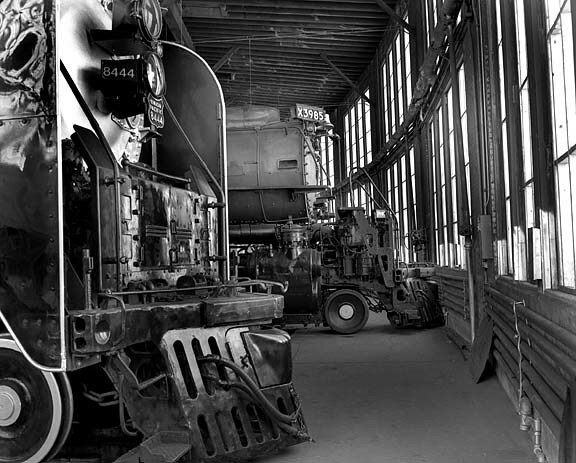 A medium format Pentax 6x7 and 75mm lens (equivalent to a 35mm lens on a full frame DSLR or 35mm film camera) was used to capture this image of Union Pacific's big steam locomotives in the Cheyenne, Wyoming roundhouse. Traditionally, the best lenses for railfan photography have been in the 28-35mm mild wide angle, or 50mm "normal" focal length range. These lenses are favored because they allow a non-distorted image of a locomotive or train typically taken with a 3/4 wedge type of composition. Small power telephoto lenses of around 100mm to 150mm are also useful when necessary to get a frame filling image of distant subjects you cannot get closer to. Bigger telephotos have generally been avoided for most railfan use, as they can introduce a more extreme compression distortion to a scene. Ditto for lenses wider than 28mm that create a stretched distortion. This 28mm wide angle to 150mm small telephoto range is also the most popular type of zoom lens for use on cameras that take interchangeable lenses, as well as being found on most point and shoots and advanced digital cameras that have a non-removable lens. But moving beyond the basic function of selecting a focal length as needed to capture a frame filling image, understanding the traits of different focal lengths can help achieve a more eye-catching photo. If you had to choose just one lens for use on a SLR (single lens reflex) camera, consider it being the 50mm. Lenses of around 45mm to 55mm have traditionally been labeled as "normal" for the common 35mm film format, in the sense they record subjects with the same perspective as the unaided human eye, making them the best choice for most railroading scenes without any of the distortion present with wider or more powerful lenses. 50mm lenses are also typically among the sharpest lenses you can buy. And stopped down to f/11 or smaller, you will have a range of sharpness (depth of field or DOF) to infinity when focused on the lead locomotive, allowing a sharp image back through multiple locomotives and the entire train. Most 50mm lenses are f/2.8 or wider, essential to maintain shutter speeds of 1/250th of a second or faster for use on a moving train when low light conditions cause a need for more exposure. The bright viewfinder from this wide aperture makes quick and accurate manual focusing easy. And 50mms are light weight, making them easy to carry and use. A final benefit for the 50mm? You get all the above advantages at the lowest cost. New top brand 50mm lenses for single lens reflex digital and 35mm cameras are priced in the $115 to $200 range. Lenses in the range of around 24mm to 35mm can also be used for general trackside photography, but because they take in a wider view than the 50mm, they are especially convenient for use in tight confines, such as inside a locomotive shop, roundhouse or small rail yard. A wide angle trait to watch out for is a "stretching distortion" when they are used up close to a subject. The wider the focal length and the closer to the subject, the greater will be this perspective distortion. While wide angles distort by stretching the perspective in a photo, photos taken with telephotos exhibit just the opposite look: perspective "compression," which is more evident the larger the lens mm. And while this compressed look is generally eschewed for traditional train photography, it can be used to purposely impart a dramatic or creative element to appropriate subjects. In the accompanying photos taken from the same location but with different lenses (and different trains), note the difference in perspective caused by the different focal lengths. To the naked eye and with a 50mm lens, the mild ascending grade (about 1.5%) here is evident, but in the 17mm shot it looks almost level. A much different and more dramatic effect is seen when shot with a 300mm lens. Note too how the multiple locomotives appear "stretched out" with the 17mm, but bunched together in the big telephoto shot. And note the different effect of each lens on the background hillside. 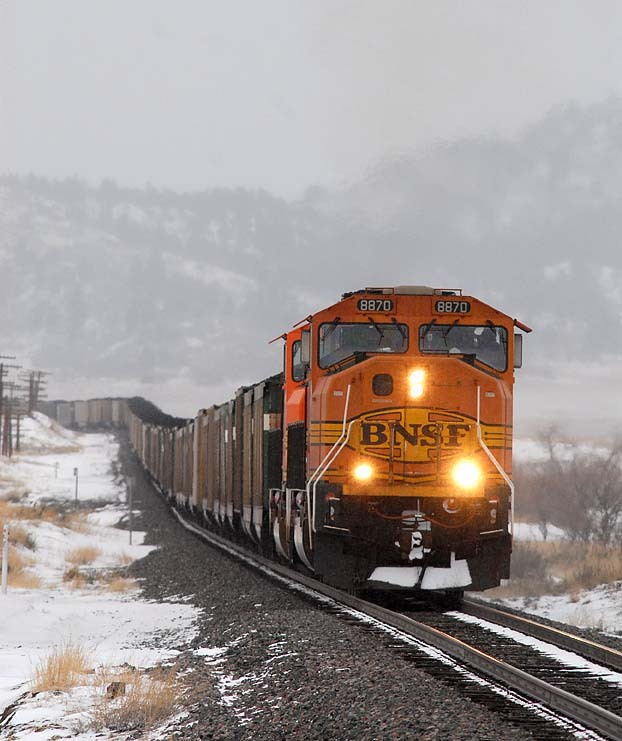 (LEFT) BNSF Powder River Basin coal load southbound on the Joint Line at Greenland, Colorado. Note how the 300mm lens on a Nikon D200 has greatly exaggerated the ascending grade, compressed the perspective on the train, and made the hillside in the background very prominent. (ABOVE) Taken with a different train but at the same Greenland location, note how a 17mm lens on the Nikon D200 has changed the perspective. The grade looks almost flat, the entire train has a "stretched" look, and the background hill now looks very small. Zoom lenses have the advantage of allowing different compositions with the same train. As the train approaches, zoom out to the biggest telephoto power for your first photo, then keep shooting while gradually turning the zooming ring to smaller focal length settings as the train approaches. With an SLR you will need autofocus to do this effectively, to avoid having to use the zoom ring and focus ring at the same time. Point and shoot zooms are usually autofocus. Most lenses are sharpest when the aperture is stopped down a couple of stops, which will be f/8 or f/11 on most lenses that have a maximum aperture of f/2.8 or f/4. If you want your entire scene from the train to the far background in good focus (deep depth of field, or DOF), use a wide angle or 50mm lens. Small mm lenses have an inherently greater DOF than larger mm lenses. Other factors that increase DOF are smaller apertures and a farther focus point. If you must use a wide aperture (such as f/2.8) to maintain a fast shutter speed in low light conditions, your background may be soft but it is more important to render a sharp train by maintaining a fast shutter speed. A large telephoto focused on the locomotive on an on-coming train, even at an f/8 or f/11 aperture, will render the far end of the train out of focus. This will usually be unavoidable, as even stopped down to the lens' smallest aperture, the DOF will not extend back throughout the entire train. The term "35mm film camera equivalent" was mentioned above. As virtually every photographer understands what 50mm, 28mm, 200mm or any other focal length size means on a 35mm camera, the 35mm format has long been the standard by which lenses for other formats are compared. But with the plethora of different format cameras typically used by railfans today, not only different film formats (35mm, medium format and 4x5) but the different sized digital sensors ("APS-C" or "DX," full frame or "FX", Four Thirds, and point and shoot small digital sensors that vary in size), at times it can be a bit confusing which lens in one format is equivalent to which lens in another format. Below are some easy to use conversion factors to determine the 35mm equivalent for different film and digital camera formats. DSLR (digital single lens reflex) cameras that take 35mm film format lenses will have either a full 35mm film frame sized "FX" sensor, or a smaller "DX" sensor (also called "APS-C") approximately the size of an APS film frame. For the full frame FX digital cameras, there is no conversion necessary: a 50mm lens is a 50mm lens, a 200mm lens is a 200mm lens, etc. But used on a DSLR with an APS-C DX size sensor, because the 35mm format lens is large enough in circumference to cover the larger 35mm film frame, only the center portion of the lens is covering the smaller DX sensor. Depending on the camera make and model, this narrows the angle of view of the lens by a factor of about 1.3 (Canon, Kodak, Leica); 1.5 (Nikon, Pentax, Fuji, Samsung, Sigma, Sony); or 1.6 or 1.7 (Sigma and Canon). Thusly, a 50mm lens from a 35mm film camera effectively becomes a 65mm, 75mm, or an 85mm lens when used on a DSLR with the APS size sensor. A 100mm lens becomes a 130mm, 150mm or 170mm; a 200mm becomes 260mm, 300mm or 340mm, etc. This illustrates how a lens of the same mm size used on different format cameras seems to yield a different focal length effect. But note that the actual image of the train in each image remains the same size, although a 180mm telephoto lens on the 35mm camera gives a telephoto effect, while a 180mm lens on a 6x7 medium format camera yields more of a "normal lens" look. Note also that this is so as only the smaller 35mm film frame covers only the center portion of the 180mm 6x7 lens adapted to a 35mm camera. Four Thirds system cameras have a digital sensor that is smaller still, being half the size of a 35mm film frame, so their lens factor is X 2. A Four Thirds 50mm lens is equivalent to a 35mm camera's 100mm lens, etc. Advanced digital and point-and-shoot (P&S) digital cameras capture images on a digital sensor that is much smaller than even the Four Thirds sensor, so require much smaller lenses to give equivalent 35mm format power. Typically, lenses of 5mm to 7mm up to as large as 75mm or so are on these cameras. To approximately compare these lenses to the 35mm film format, multiply by 5.6. Therefore, a P&S with a 5mm to 25mm zoom is equivalent to about a 28 to 140mm lens in the 35mm format. A 7mm to 18mm lens is equivalent to about 40mm to 100mm. And an upper end zoom range such as 75mm is equivalent to about 420mm. Medium format: While exact parameters to compare a full list of all lenses for the five medium format camera systems (645, 6x6, 6x7, 6x8, and 6x9) to their 35mm equivalents can get rather detailed and long, a simple, quick and practical for trackside photography way is to divide the medium format's lens mm size by a factor of 2. For example, 90 to 105mm lenses are considered as "normal" on a 6x7, 6x8 or 6x9 camera, the same as a lens of around 45 to 55mm is "normal" for the 35mm format.